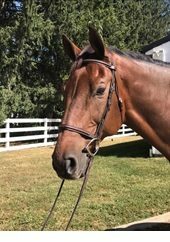 Conley is a former show jumper and recent addition to Gleneayre. We’re excited to welcome this gentle giant to our barn! He enjoys spending time outside with his friends. Sensible and kind, Conley is great at teaching timid riders to jump. At first, he was a bit shy, but he’s coming out of his shell and loves attention from our youth participants at the barn.